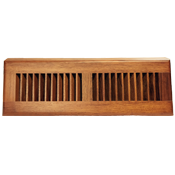 Brazilian Cherry wood baseboard vent covers provide a warmer look than metal vent covers. Wood air registers are finished with a clear lacquer, displaying the woods natural beauty. These baseboard vent covers are suitable for use with ducts on the floor or wall along the baseboard, simply adjust the flap damper accordingly. Wood air registers with a flap damper are either open or closed, there is not an in between setting. The baseboard vent covers are made of 100% wood with a solid Brazilian Cherry faceplate. 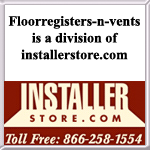 Installation of your new baseboard vent cover is easy. Simply remove the wood air registers faceplate and screw the frame into the base of the wall, then replace the faceplate. The removable faceplate on the wood air register allows for both easy installation and cleaning. Find unfinished Brazilian Cherry baseboard registers that you can stain-to-match your trim.